Dave Roberts, the fleet outfielder who executed arguably the most famous stolen base in baseball history, raced past other candidates to grab the job as the Los Angeles Dodgers’ new manager. The team that broke the color line on the field finally breaks its own color line in the dugout. The Los Angeles Times reports that inside sources revealed that Roberts, 43, would become the Dodgers’ first minority manager; Roberts’ father is black and his mother Japanese. The Dodgers’ three-year contract with Roberts includes an option for a fourth season; he joins the Nationals’ Dusty Baker and the Braves’ Fredi Gonzalez in the group of minority managers. 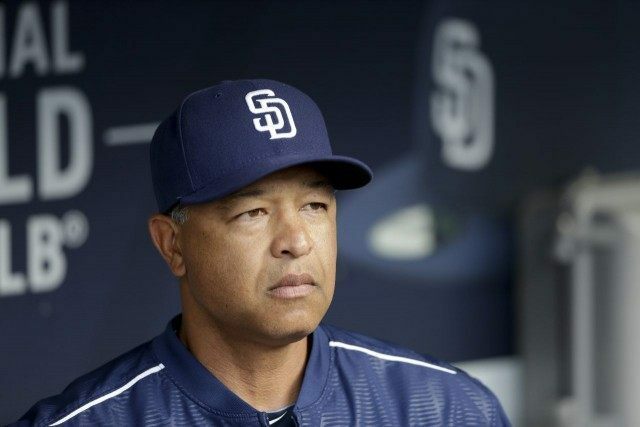 Roberts has not managed before, but has served with the San Diego Padres as a coach since March 2010. He was diagnosed with Hodgkin’s lymphoma in October in October of that year. He announced clean scans in June 2011. Other candidates for the Dodgers’ managerial position included Dodgers’ farm director Gabe Kapler, the prospective favorite, close personally with Andrew Friedman, the team’s president of baseball operations; bench coach Tim Wallach; third-base coach Ron Roenicke; former Padres manager Bud Black, former Dodger Kirk Gibson, Chicago Cubs bench coach Dave Martinez, New York Mets bench coach Bob Geren, and former Angels outfielder Darin Erstad. Roberts, taking over for Don Mattingly, who left the Dodgers to manage the Miami Marlins, inherits a team boasting the highest payroll in baseball. Roberts, whose father served in the Marines, grew up in San Diego, played at UCLA, was drafted by the Detroit Tigers in 1994, then was traded to the Cleveland Indians. He played for the Indians from 1999-2001 and the Dodgers from 200s until the trading deadline, when he was traded to the Boston Red Sox, prompting the most famous steal in history. In the fourth game of the 2004 ALCS, with the Red Sox on the very brink of elimination down 3-0 in the series and 4-3 in the bottom of the ninth inning, Roberts pinch ran for Kevin Millar, who had drawn a leadoff walk from stingy reliever Mariano Rivera. Everyone in Fenway Park knew Roberts’ mission was to steal second base; Rivera himself threw three times to first base, the last time almost nabbing Roberts. On the first pitch to Bill Mueller, Roberts tore for second base, narrowly beating a throw from Jorge Posada. Mueller then singled him home, tying the game, and setting the stage for the two-run homer from David Ortiz in the twelfth to win the game. The Red Sox then swept the rest of the series, becoming the first team in baseball history to come back from a 3-0 deficit and going on to win their first World Series in 86 years. Roberts subsequently played for the Padres in 2005-06 and the San Francisco Giants in 2007-08 before retiring. He hit .266 for his career with 243 stolen bases.